What began as an unlikely friendship between an adolescent Viking and a fearsome Night Fury dragon has become an epic trilogy spanning their lives. In this next chapter, Hiccup and Toothless will finally discover their true destinies: the village chief as ruler of Berk alongside Astrid, and the dragon as leader of his own kind. As both ascend, the darkest threat they’ve yet faced - as well as the appearance of a female Night Fury - will test the bonds of their relationship like never before. The 'How To Train Your Dragon: The Hidden World' competition has now closed. Winners will be announced shortly. Competition opens at 5pm AEDT on Sunday 7th April 2019 and closes at 11:59pm AEDT on Sunday 14th April 2019. Five winners will be chosen at random on Monday 15th April 2019. To successfully win, entrants must fulfil the above entry conditions before the time the competition closes. Current members/followers are eligible to enter the competition. Only one entry per person. Only one winner per household. To be a valid winner, the entrant must not have won a prize from SWITCH within the last 28 days. 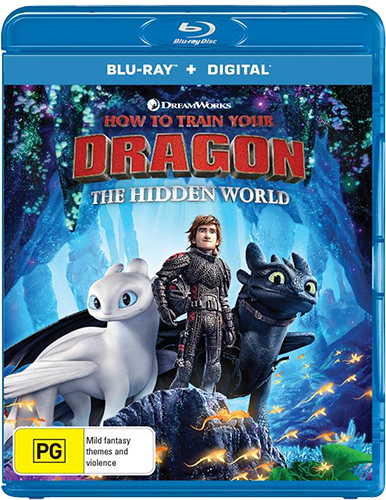 Each winner will receive one Blu-ray copy of 'How To Train Your Dragon: The Hidden World'. By entering, you agree to receive occasional emails from SWITCH in the future. If you decide to unsubscribe from these updates, any further entries will not be applicable. Only Australian residents are eligible to enter. 'How To Train Your Dragon: The Hidden World' is available on 3D Blu-ray, 4K Ultra HD, Blu-ray, Digital and DVD on Wednesday the 10th April 2019 from Universal Sony.